I was born and raised in Barranquilla, in Colombia and since I was young I have been passionate about Human Rights. Joining Model United Nations at the age of 14 definitely changed my life, since all I could dream about was to help others. Few years later I decided to study International Relations at Universidad del Norte in Barranquilla, where I continued participating in MUN and MOAS (Model of the Organization of American States). In 2010 I did an internship in the Department of International Affairs at the Organization of American States in Washington D.C., where I worked with Civil Society. After completing my internship I decided to move to Egypt and work with AIESEC (NGO), teaching children, I stayed there for almost 4 years, working learning about their wonderful culture and Arabic as well. 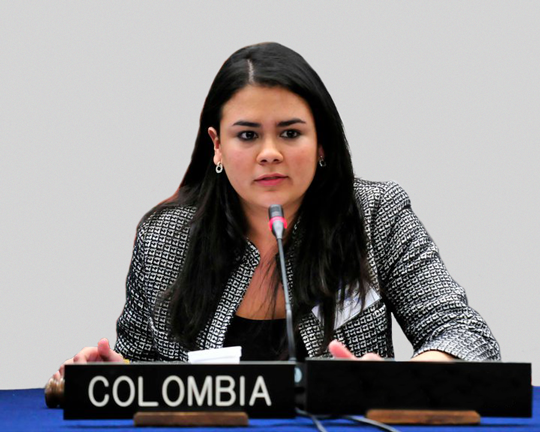 In 2014 I moved to Lebanon to work at the Colombian Embassy, where I am a Consular Agent. I deal with different kind of challenges, helping Colombian nationals and other consular affairs. I also joined Rotaract Club of Sahel Metn a year ago, and I am currently the Head of International Development Committee. And last but not least, NEVER forget you are strong enough to make a difference!